Modest Swimwear ~ Modbe Clothing ~ NEW LoWer Prices!! On a Personal note....I'm having Modbe withdrawls & Missing their CuTe products,anyone else with me?! Girls4Sport is designed by Women 4 Women....What more could we ask for?! Girls4Sport also "Specializes" in Women's Board Shorts! They have so many Styles (some are even reversible!) in 3 different legnths! Girls4Sport knows this & has made their Swimwear "FleXiBle" for the "AcTiVe & Not so much Active Woman" in all of US! .....Running, Swimming, Biking, VolleyBall, Sailing, Surfing, WakeBoarding, or just hanging out with the Kids at the Beach.... You're Skin will be protected (98% of UVA/UVB rays blocked) & Covered (Mix 'n Match in Tops & Bottoms) to your Body Type! Shop Girls4Sport HERE & enter Coupon Code: M4M-15 & receive 15% OFF your entire Pruchase! 2 FREE Swimwear items of your choice in Style!! Simply Visit Girls4Sport & tell me what "Style" of Swim Top & Bottoms You would Choose if YoU Win!! - Write on Girls4Sport's fb wall: "Thank You" for the Giveaways on Modest4Me! The WINNER will be picked "Randomly"! ** Giveaway will End the day of Sat. Aug. 14th at 12am (Midnight) MST. I will e-mail the winner on Aug. 15th & they will have 48hrs to contact me. You can read my Disclaimer & Policy Review HERE. "Thank YoU!".... to all of YoU, for Your Support! ShoPPinG for a Swimsuit can be Rough! Especially if you are looking for a Modest Swimsuit! 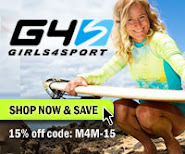 Girls4Sport offers many ammenaties ~ Rashguards with Matching Bottoms that are tailored very specifically for the female form, SPF Swimwear & True Women's Board Shorts, just to name a few! The Junior's Swimwear is Modest, but yet Flirty! ~You can even Mix 'n Match the different Styles of Swim Tops & Bottoms that you will surely LoVe! A True Swimsuit combo that Fits you & your personality! 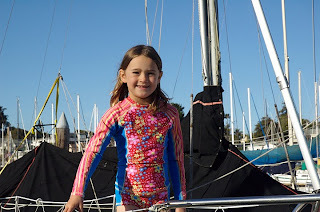 Girls4Sport also has Kids/Toddler Swimwear! ~They Offer: Girls Cap Sleeve Swimtops, Longsleeve Swimtops, ThermaGuard - Long sleeve Tops, & More! The Different Style Bottoms are FuN! 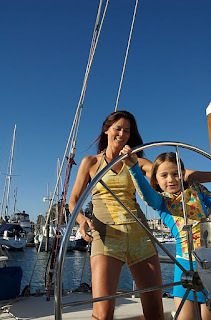 ~ My FaVoRiTe are the Swim Skirts that have Attached Swim Bottoms in them! **Girl4Sport is Giving ONE LUCKY PERSON an opportunity to WIN their Choice of "Style" in a Swim Top & Bottom! Simply visit Girls4Sport & Tell me what "Style" of Swim Top & Bottom you Like...You can tell me more than one Style! 2.) Have a Friend, Relative or whatever you want to call them... "Nominate" YOU or YOU can "Nominate" Someone for the Swimwear Giveaway! The Modest4me Reader with the Most Entries will WIN! **Giveaway will End the day of Sat. Aug. 7th at 12am (midnight) MST. I will e-mail the Winner on Aug. 8th -- Winner will have 48hrs. to reply back to me.